You can't have a wedding without a wedding cake. But a grand, lavishly decorated wedding cake can cost hundreds, even thousands of dollars. If your budget is already stretched, there's a delicious and affordable alternative to having an expensive wedding cake made at a bakery. You can make your own 3-tier wedding cake with basic baking ingredients and supplies. Making a dramatic tiered cake can be tricky, but if you follow these steps carefully you can have your cake and eat it, too. Before you mix any ingredients together, preheat the oven to 325 degrees and spray the bottoms and sides of the three round cake pans with nonstick cooking spray. The pans should be 6 inches, 9 inches and 12 inches in diameter. Each pan should be 3 inches deep. You can make whatever flavor cake you want, but if you use a different recipe from the one in this guide, make sure it's specifically for wedding cakes and will make the correct amount of batter to fill the baking pans. Any recipe you use should make at least 20 cups of batter. The recipe used for this guide is for a classic white cake that also features strawberries. In a large mixing bowl, put 10 cups of sifted flour and 3 tbsp plus 1 tsp of baking powder. Sift these two dry ingredients together. With a whisk, beat 20 egg whites in a medium-size copper bowl. The copper bowl will give the egg whites more volume. The egg whites should be at room temperature. Add a pinch of salt to the mix and stop halfway through the whisking to add a few drops of lemon juice. The lemon juice will stabilize the egg whites. Beat the egg whites until they're stiff. Add 2 1/2 cups of softened butter or margarine to 5 cups of granulated sugar in a large bowl. Mix these two ingredients together until the mixture takes on a creamy texture. Add 1/4 of the flour and baking powder mixture to the sugar and margarine mixture and blend with an electric mixer on slow speed. Add a splash of the 3 1/3 cups of milk and continue to mix. You will alternately add 1/4 of the flour mixture and the milk until all of the ingredients are mixed. Add 1 3/4 tsp of pure vanilla extract to the mixture and beat well. Pour 3 cups of the batter into the greased 6-inch round pan. Pour 6 cups of the batter into the greased 9-inch round pan. Pour 11 cups of the batter into the greased 12-inch round pan. Bake the cakes for about 25 minutes. Check to see if they are done by inserting a toothpick into the center of each cake. If the toothpick comes out clean, the cake is done. Allow the cakes to cool for at least 30 minutes. Loosen the edge of the cooled cakes from the pans by running the knife between the cake and the pan. Flip the pans over and allow the cake tiers to slide out onto a cooling rack. Let them sit until they cool completely. To make champagne buttercream frosting, beat 1 1/2 cups of shortening and 1 1/2 cups of butter together in a small bowl. Add 2 tbsp of champagne and mix well. Sift 9 cups of powdered sugar into the shortening mixture and beat it until it's smooth and creamy. Add more champagne if the mixture isn't smooth enough. This mixture should make about 7 cups of frosting, enough to cover the entire three-tiered cake. Cut each tier in half horizontally with a serrated knife. You should cut all three tiers, giving you six layers all together. Set the bottom half of each tier onto a cardboard circle that corresponds to the size of tier. You should have three cardboard circles: 6 inch, 9 inch, 12 inch. Spread a thick layer of strawberry preserves atop the bottom half of the 12-inch tier. You will need 5 pints of fresh strawberries. Cut off the tops of the strawberries and then slice each strawberry in half. Place the flat, cut side of the strawberries on top of the strawberry preserves. Cover the entire surface of the tier with the strawberries. With a spatula, spread a thick layer of the champagne butter cream frosting atop the strawberries. Place the top half of the cake tier atop the frosting. Add preserves, fresh strawberries and frosting in the same manner to the two other bottom pieces of the tiers. Place the top halves on the bottom halves. 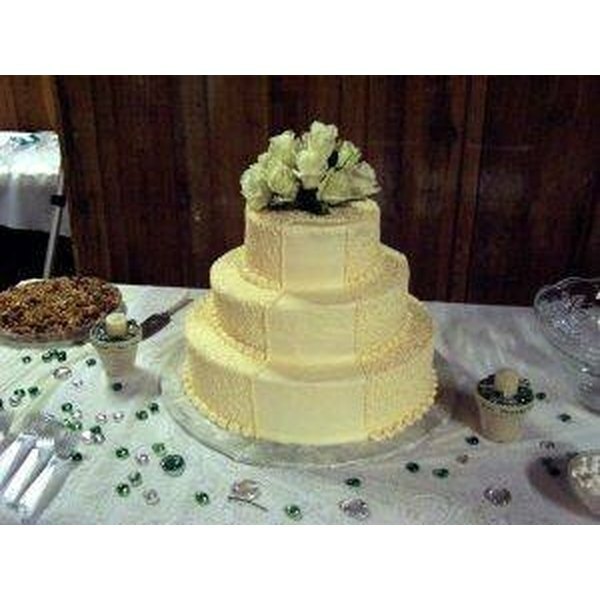 You should now have three tiers, each tier composed of two layers of cake with strawberries and frosting in the middle. Brush off loose crumbs from the tiers. With a spatula, spread a thin layer of frosting on the top and sides of each cake tier. This is the crumb layer. Set each tier in the refrigerator for 30 minutes. Remove the tiers from the refrigerator and insert a nonflexable straw into the center of the 12-inch tier and then 4 straws around the center in a square formation. These straws should be about 2 inches from the edge of the tier. Cut off the protruding ends of the straws so that you have a flat, even surface on the top of the cake tier. The straws will support the tiers and keep them together. Place the 12-inch tier on the platter that will be used to present the cake on the wedding day. Insert straws in the two other tiers and trim them. Place the 9-inch cake tier in the center of the 12-inch tier. Be sure to keep the cardboard circle underneath the 9-inch tier. Place the 6-inch tier in the center of the 9-inch tier, again making sure to keep the cardboard circle beneath the tier. Spoon out a dollop of frosting on top of the 6-inch tier. Smooth the frosting on top of the tier and down the sides with a spatula. Smooth the frosting down each tier generously. 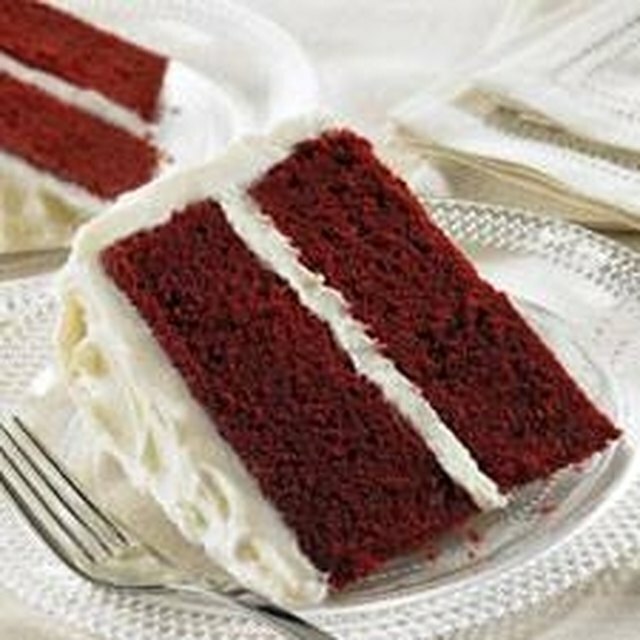 Once the entire cake is covered, wet the spatula and smooth away any bumps, crumbs or creases in the frosting. Wet the spatula as many times as you need; the water will help smooth out the frosting. Add fresh flowers, strawberries and icing to the tiers. You can be as creative as you like. Go for a simple look or make a complicated, detailed design. Bake the wedding cake 48 hours before the wedding. Wrap the unfrosted cakes in aluminum foil if you need to store them before frosting and assembling them. Add fresh flowers to the cake the day of wedding so they don't wilt. Make sure any flowers added to the cake do not contain any harsh chemicals.